Architect: McGuire Igleski & Assocs. Summary: The commission on Chicago Landmarks announced 21 outstanding projects September 6, including properties designated as Chicago Landmarks and properties within Chicago Landmark Districts. Among the noteworthy improvements were the exterior renovation of the Krause Music Store by McGuire Igleski & Assocs., exterior and interior of the Chicago Board of Trade by the CME Group, stewardship of the Lincoln Park Zoo Lion House with the exhibit design architecture by Interactive Design Inc., and exterior rehabilitation of the Biograph Theatre by Daniel P. Coffey & Assocs. 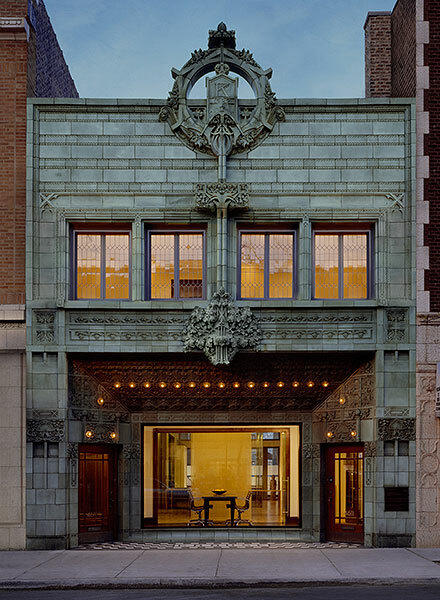 Louis Sullivan and William Presto collaborated on designing the elaborate terra-cotta facade of the Krause Music Store. It was Sullivan’s last project. His intricate ornamentation is self-evident in this work. The current owner purchased the building and restored the terra cotta facade, the storefronts, and the upper-floor leaded windows. “The Landmark Preservation Award recognizes property owners, developers, businesses, and organizations for their stewardship in preserving Chicago’s architectural and cultural heritage,” said Chicago Department of Planning and Development Commissioner Arnol Randall. Chicago has 238 individual landmark buildings, monuments, and sites and 46 designated landmark districts, which total more than 8,000 structures of historical significance. The Commission on Chicago Landmarks, whose nine members are appointed by the mayor and city council, works with homeowners, businesses, organizations, and developers to preserve and maintain historic properties. Preservation Award winners were selected by the Commission on Chicago Landmarks, based on the previous year’s projects that received approval from the Commission’s Permit Review Committee. Only properties that have been designated by the city council as individual Chicago landmarks or as part of a Chicago Landmark District were eligible. The awards are presented to owners in recognition of their critical role in preserving the city’s historic landmarks and keeping them in active use.